After the successful deal with the government to complete the Filey camp for wartime use, Billy Butlin was asked to find another site on the North Wales coast. The area chosen consisted of 150 acres of gently rolling farm land which was bordered by the mountains on one side and the sea on the other. Although located in a remote area, about 4 miles east of the town itself, it boasted good transport links as a railway line passed right through the middle. It even had a ready-made station originally built to serve the local farming community. After only three weeks of construction 8,000 servicemen arrived and had to sleep in tents until the buildings were finished. On completion it became known as HMS Glendower and was used as a training centre for the Admiralty and Merchant Navy. At the end of the war the site was sold into Butlin's ownership and, after much local opposition including a public inquiry, was opened as a holiday camp in March 1947. Initial capacity was around 5,000 but this was gradually increased to 8,000. The miniature railway was added in 1953 and differed from most in that it fulfilled a genuine transport need. It ran for 3/4 of a mile along a scenic route from the centre of the camp to the beach. The line had a very successful 43-year career before finally closing in 1996. 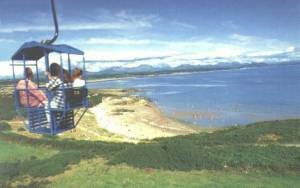 A lengthy chairlift also appeared in 1960 and ran over a similar course to the railway - it was noted for its spectacular views. Ringo Starr appeared at the camp during his pre-Beatles era. His group, Rory Storm and the Hurricanes, appeared for a 13-week engagement in 1960. The booking was due to start on 4th June but Ringo declined due to his impending marriage. In the end the marriage was cancelled so he could go to Butlin's! 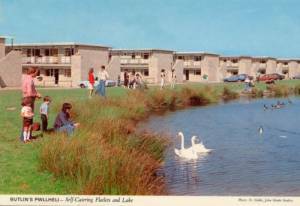 The group returned again the following year, before transferring to the Skegness camp in 1962. 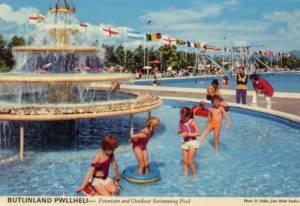 A postcard that Ringo sent to his grandmother whilst staying at Pwllheli was recently auctioned for £950 - surely a record price for any Butlin's postcard! Philip Mountbatten, who later became the Duke of Edinburgh and the Queen's husband, was one of many thousands of young sailors who had passed through the gates of HMS Glendower during the war. This led to a royal visit by himself and the Queen in August 1963. In 1987 the camp became home to the Vekoma Boomerang, a large roller coaster which thrilled riders with 3 forward and 3 backward loops. The coaster remained until the end of the 1997 season when it was sold and shipped to the United States. It operates today at Dixie Landin', a theme park in Louisiana, and is now known as the 'Rajin Cajun' coaster. In 1989 more than 3500 holiday makers were forced to leave due to a tornado - the damage was estimated at £2 million. A £30 million investment scheme was announced in 1990 and the camp became known as Starcoast World. In common with the other camps, the centrepiece of this investment was a new subtropical waterworld, in this case known as "StarSplash". At the end of the 1997 season it was announced that the Pwllheli camp, along with Ayr, would be transferred to Haven holidays, a sister company of Butlin's. Another £25 million development plan was announced, split between the two parks, and work soon began on demolishing many of the old buildings and chalets and replacing them with static caravans. Most of the old attractions were removed including the chairlift, miniature railway, roller coaster and funfair. The new plan was to offer fewer but more up-to-date facilities and to place the emphasis on attracting more younger families. The site is still open and is now known as Hafan-y-Mor, a Haven All-Action park.